The National Weather Service In San Angelo Has Issued A * Severe Thunderstorm Warning For... North Central Schleicher County In West Central Texas... Tom Green County In West Central Texas... Southwestern Runnels County In West Central Texas... Western Concho County In West Central Texas... ...Read More. CROCKETT – The city of Crockett is the county seat for the oldest county in Texas. Anytime you’re affiliated with the oldest of anything, it’s easy to surmise the bright, shiny newness has probably faded. Such is the case for Crockett. Years of neglect allowed the city’s infrastructure to begin a slow decay into ruin. However, there is hope on the horizon for the paradise in the pines. Careful, albeit slow, progress has been made on revitalizing the city’s underpinning and on Friday morning, March 15, Crockett City Administrator John Angerstein spoke about how the municipality is making a comeback. One of the city’s biggest ventures has been the USDA Water Improvement Project. It is estimated the total cost will be in the neighborhood of $3.4 million. One of the areas this project will cover is the city’s elevated water storage tanks. “Our water towers are in severe need of rehabilitation. They’re leaking, they’re rusting, they have issues going on and they need to be serviced immediately. We will go in and take each one off line separately. We’ll be replacing the piping on them. We will completely strip them, sandblast it, prime it, clean the whole thing from top to bottom and paint it inside and outside, with new logos,” he said. The last time a project of this scope occurred, Angerstein revealed, it was over 20 years ago. A second part of this project is the replacement of the ground water storage tanks. “They were inspected in the early 2000s and they reported ‘imminent failure’ was likely. Both of them need to be taken out of service. The structural integrity of the tanks is shot. The banding around the two is leaking and at any moment they could give way. We tiptoe when we go around it! Not really, but they’re in bad shape,” he chuckled. Up until now, the city of Crockett was simply unable to afford to do anything about the ground storage tanks “… but this project will allow us to take down both of those tanks and build a new concrete facility with a 100-year life expectancy,” Angerstein explained. Angerstein said the accuracy part would benefit the customer while the automated part of the meter would save the city money through fewer manpower hours. Bids on this project are still being received until April 2. “This will be a huge shift in both efficiency and accuracy. It will also save us money in the water department which will allow us to use our resources where they are better needed,” he said. The city administrator explained this started out as a grant “opportunity” but added the city was denied the grant because the city’s water rates were too low. It went from a grant to a 50 percent loan forgiveness option, but once again, Crockett did not qualify because the city’s water rates were too low, according to federal guidelines. “Because the need is there, we have to fund this. At the end of the day, in financial savings, we can pay for this. In year one, it will pay for itself. Just in manpower savings alone, we will save more than the yearly note will cost us,” he said. Other water projects the city has taken on include: the South 4th St. water main at a cost of $300,000; the Durrett St. water main at a cost of $175,000; the Hwy 21 water main at a cost of $50,000; and the US Hwy. 287/Loop 304 tie-in at a cost of $40,000. “This will come out of our cash reserves. We haven’t done this is many, many years. We haven’t replaced them, we’ve just run around and tried to patch them. We’re beyond that now. We have one team right now that all they do is run around and patch water lines. We also have another crew who chases potholes all day long. We’re just in a reactive mode, if we continue this process. We have to get out of the reactive mode,” Angerstein said. 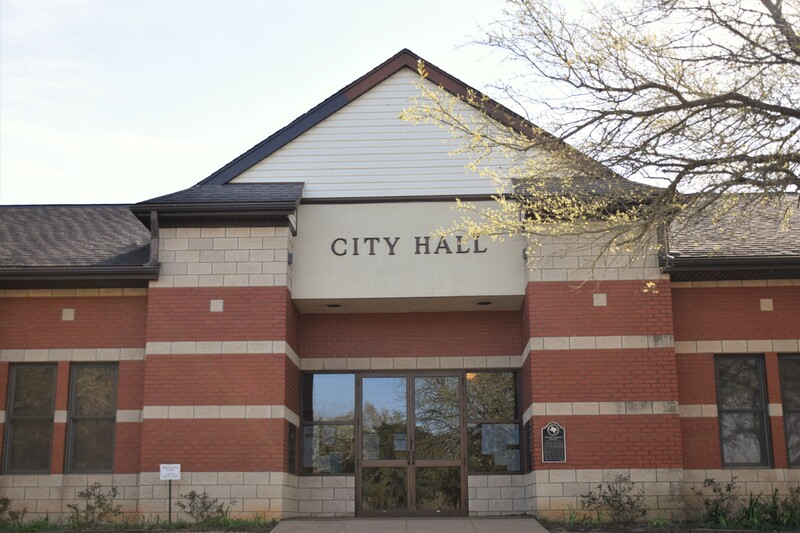 A Community Development Block Grant pertaining to a sewer line is nearing completion which addresses a 12” sewer pipe connecting to a 6” sewer pipe. This grant is 100 percent funded and cost the city very little, if any, money at all. Another project the city has undertaken is what’s known as a Downtown Revitalization Grant. “Our city council declared our downtown area as blighted. That shows our council is being realistic, recognizes the problem and is addressing it. Ten years ago, we had a shot at this grant and it was closer to $1 million and no one would sign off on any paperwork saying our downtown was blighted. If you drive through our downtown, more than 50 percent of the buildings are empty. I believe the downtown area is the heart of the city. We have to focus on our downtown to help get the ball rolling,” Angerstein said. Part of this project will involve new city sidewalks, brick inlays, hand rails and other ADA compliant measures. This will occur on East Houston Ave. and work should begin within the next two months. As the city administrator continued, he also spoke about the city’s home program grant. “We have four people who went through the whole process and qualified for this program. We are building them brand new homes at zero cost to them. Elderly residents who have a moderate to low income and live in unsafe conditions – bad floors, bad roof – we go in and tear down their old home and build a brand new one for them to move into. The city only has a five percent match,” he said. The grant – in the amount of $420,000 – is funded through the Texas Department of Rural Housing Affairs. Other grants the city is involved with include: a $150,000 Texas Department of Parks and Wildlife Grant which Angerstein said he believed the city should receive; a $150,000 CEF grant for purchase of a mammogram machine to be used at the hospital; a $70,000 master planning grant; and a DETCOG solid waste grant. Before he concluded, Angerstein said the city was also undertaking street construction projects at a cost of $200,000, paid for by the city. “We have the equipment now to go in and mix up a road when the base is shot. We can go in remix it, re-grate it, shoot it, roll it and pack it. Now, there are no excuses. The council approved going from $60,000 to $200,000 this year in our street construction budget to buy materials,” he said. Completed roadways include Woods Avenue, Sins Street, and Fannin Street.